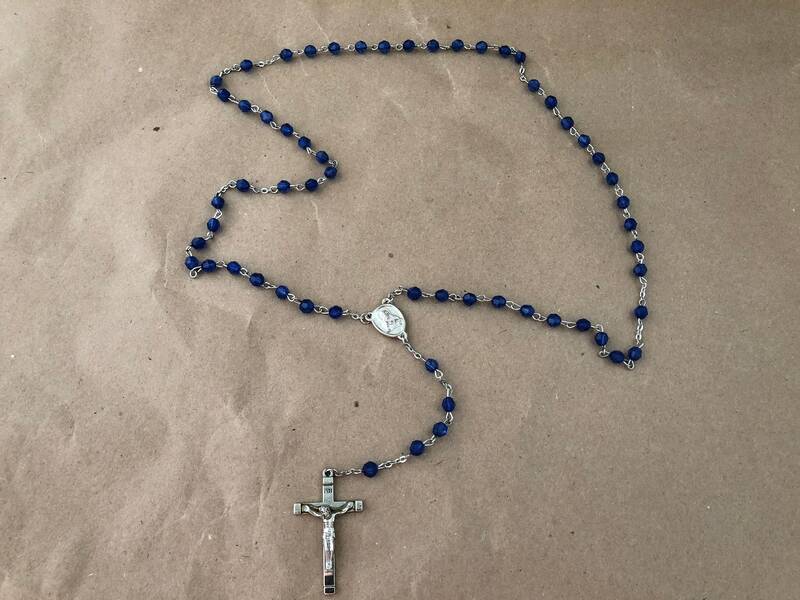 This rosary is vintage from an estate, but does not appear extremely old, and is in very fresh condition. The blue faceted beads are of a rich color, but also light enough to let the light passing through create a charming sparkle. This type crystal rosary has always been popular with Catholic ladies for its special soothing reflective charm. The rosary consists of the usual five decades with introductory beads for a total of 55 glass faceted beads. The beginning crucifix and center medal are nice quality and not tarnished, but not sterling silver. The beads themselves seem to have been hand joined, but the chain in between decades appears manufactured. The rosary is of course looped to the center, but stretched out would extend about 35-36 inches. Everything about this piece is in excellent condition.